This is my favorite shopping day of the year! I love good deals, and love it even more when I can get them from the comfort of my own home!! Here’s a quick round-up of some deals I found around the web. I’ll add to this post as I find more throughout the day! Amazon is having a sale on Easy Lunchboxes today. I’ve mentioned them before, in my back to school post, as I just love using them for my kids’ lunches and my own. I purchased 2 sets, and in the 4 years I’ve been using them, I’ve only had 2 lids crack just a bit at one corner. Otherwise, they are still in as great of condition as the day I bought them, and we use them every day! They are dishwasher safe too, so I love the easy clean-up. I feel like these really help me make sure I provide my kids with balanced lunches as they make me pay attention to portion sizes and what I’m putting into each section. You can get your own set of 4 of these EasyLunchboxes Bento Lunch Box Containers on sale for $11.16 today, which is 20% off the normal price. There is a great deal on Living Social for a huge combo pack of Jules gluten-free flour and mixes. You’ll get a 5lb. bag of Jules amazing all-purpose flour, 1 bag of cookie mix, 1 bag of cornbread mix, 1 bag of graham mix, and 203 recipes in her ebooks. You can buy all of this for $30 + $12 shipping. But today Living Social is offering a 25% code so you can save even more. Just head to the Jules deal on Living Social and enter the code: CYBERMONDAY to save the 25% off, bringing your total to $22.50! I just bought this deal myself as it is too good to pass up! Jules also has another deal available directly from her site for 20% off everything if your cart is at least $39! Code: 20off Shop Jules here. 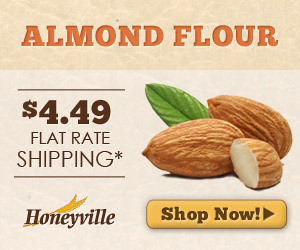 King Arthur Flour is offering free shipping today on your $60+ order. They have a great selection of certified gluten-free items. I LOVE their pancake mix and their brownie mix. They are great to have on hand for when you need something quick! 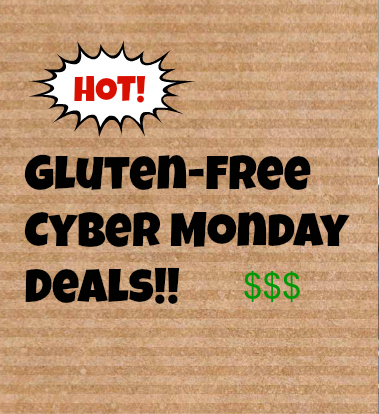 Katz Gluten Free is offering 50% off their pizzas with the code: CYBER50. They also offer free shipping with your $50 purchase. I haven’t tried their products, but my friend’s daughter with a wheat allergy LOVES them. She stocks up her freezer with products for her daughter to enjoy. 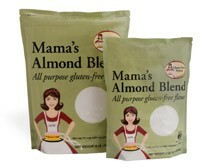 Gluten Free Mama is having a HUGE sale for 40% off everything on her site! You know I love her all-purpose almond flour blend and pie crust already! 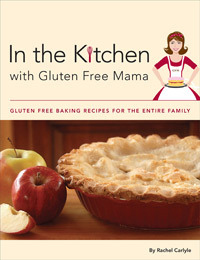 I also love her cookbook, In the Kitchen with Gluten Free Mama. I definitely recommend you stock up!! Shop her store here and be sure to use the code: Black Friday to save 40% off! For all the rest of your online shopping today as you are finishing up your Christmas present buying, I highly recommend you go through Ebates. Once you have an account with them, you simply start your shopping there, clicking to your favorite stores from their site. Then, after you make your purchase, you’ll earn cash back! I’ve been using Ebates for about 4 years and have earned $130 in cash back during that time. Not bad for simply clicking to their site to start my shopping! The cash back I earn becomes my “fun money”. I have another friend that uses Ebates and when her cash back checks arrive, she places them into her kids’ college savings funds! I’m going through Ebates today to do my shopping at The Children’s Place, Toys R Us, and Crate & Barrel! Sign up for your Ebates account here.